Outside of Paris, France, tens of thousands of Iranians gathered to protest the Iranian regime and demonstrate for the peaceful transition to a free and democratic Iran unshackled from the control of the ruling mullahs. Amid the sea of flags and enthusiastic supporters was the optimistic feeling that the moment was fast approaching where that transition could finally happen as Iran is rocked with mass protests that have so far spread to over 140 cities, towns and villages and represent the most serious threat to theocratic rule in the Islamic state’s history. Those protests have been fueled by a faltering economy including a near-death spiral in the value of the rial which ballooned to over 90,000 rial to a single U.S. dollar; doubling in only a few months. While the regime has tried to blame President Donald Trump’s decision to pull out of the Iran nuclear deal for the economic implosion, the truth on the streets of Iran is that Iranians are pointing the finger at rampant corruption in the government and the decision to spend billions on wars in Syria and Yemen that have only succeeded in ostracizing Iran further from the international community. The conclusion being reached in Iran is not that the U.S. is killing the nuclear deal as much as Iranian regime’s involvement in the Syrian war and support for global terrorism is what is driving the isolation. 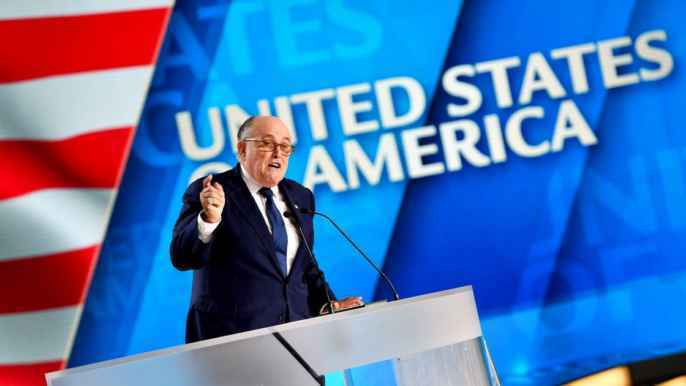 It is against this backdrop that the annual gathering in Paris of the Iranian opposition movement represents an almost intolerable image for Tehran; thousands of Iranians all united in supporting democratic change and being addressed by speaker after speaker including prominent members of the Trump administration, former New York mayor Rudy Giuliani who is now the president’s personal attorney. Giuliani made a strong call to ramp up sanctions as the protests in recent months have continued spread. Amidst that image of united opposition came the news that an Iranian diplomat was among four people arrested in connection with what Belgian authorities said was a foiled bombing attack targeting the rally. Belgian authorities said an unnamed Iranian diplomat, who works for Tehran’s mission to Austria, was arrested in Germany, while a married couple – Belgian citizens of Iranian heritage – were detained with “attempt at terrorist murder and preparing a terrorist crime” against the MEK. A fourth suspect was arrested in France. The arrests come ahead of a rare visit to Europe by the Iranian president, Hassan Rouhani, who is scrambling to salvage the 2015 nuclear deal after Trump said the US would not honor it. A statement by the secretariat of the National Council of Resistance of Iran (NCRI), an umbrella group of the MEK, said: “The conspiracy of the terrorist dictatorship ruling Iran to attack the grand gathering of the Iranian resistance in Villepinte, Paris, was foiled. According to the press, the Iranian couple were in a Mercedes car when they were stopped by special forces and arrested on Saturday in Woluwe-Saint-Pierre, which is close to EU institutions in Brussels. According to Belgian media, police found 500 grams of TATP explosive and a detonator hidden in a toiletries bag. German police arrested a 46-year-old diplomat at the Iranian embassy in Austria, whom police described as a “contact person” for the couple. And French police arrested a 54-year-old described as an accomplice. Authorities said they had monitored communications among the individuals. A Belgian law enforcement official said investigators suspect the couple took orders from the Iranian diplomat. Security analysts and Western officials say Iranian intelligence agencies maintain extensive networks in Europe to carry out covert operations. The Iranian regime has a long history of mounting attacks on the various Iranian dissident groups opposing it including a publicized series of attacks on refugee camps in Iraq housing thousands of MEK members before they were finally resettled in Europe. The bombing plot is further proof of the Iranian regime’s lack of regard for peaceful relations with the rest of the world. The fact that the plot involved agents and operatives in Germany, France and Belgian pointed out the rank hypocrisy in the supposed moderation in Rouhani’s administration and why EU policy in trying to keep the nuclear deal alive is terribly flawed. The efforts by the regime to blunt the effectiveness of the resistance movement have included making membership by any Iranian or support for the group in any manner punishable by death. The regime has also vigorously invested time and money to fund the Iran lobby in an active effort to mount PR campaigns aimed at discrediting these groups; most notably the National Iranian American Council which has made it its mission to discredit the MEK. This includes the creation of fake websites operated by the regime’s intelligence services and using comment boards for news organizations to disparage any positive news stories of the resistance movement. The arrests in Belgium are noteworthy because of the rise in Islamic extremist terrorist attacks there which have been supported and encouraged by the Iranian regime. This escalation to directly attack a peaceful rally attended by men, women and children with speakers such as Giuliani should convince any doubters of the blood thirsty intent of the mullahs in Tehran.